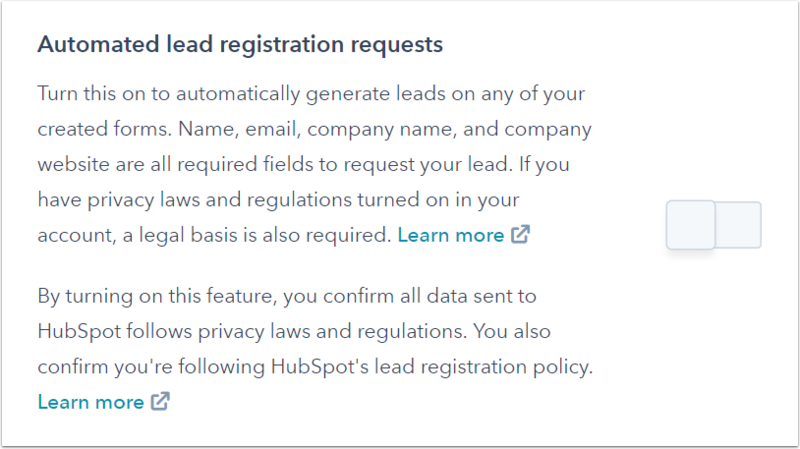 If you are a HubSpot Partner, you can automatically send lead requests to HubSpot after a lead submits a form by enabling the Automatically send lead requests to HubSpot option in your account settings. In the left sidebar menu, select Partners. Click to toggle the Automatically send lead requests to HubSpot switch on. With this enabled, whenever a lead submits on one of your forms, a lead request will be sent automatically to HubSpot. If you have GDPR enabled in your account, you must request a legal basis on your form. Before turning this setting on, enable CAPTCHA on your forms. Without the anti-spam feature enabled, your registration capacity could be filled up with SPAM leads which would prevent you from sending more legitimate leads to HubSpot.